The bank says that "all government guarantees remain in place"
Nationalised lender Northern Rock has been given longer to pay back its £26bn loan as part of government efforts to boost lending and the economy. The bank had been encouraging customers to re-mortgage with other lenders so it could pay off the loan quickly, but this policy will now be relaxed. "This means that more mortgage customers will the able to stay with Northern Rock," the bank said. 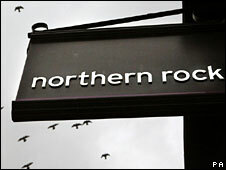 Northern Rock said "there will be no impact" on its savings customers. Northern Rock, which was bailed out by the government after a run on the bank in 2007, added that "all government guarantees remain in place". The bank has been encouraging existing customers to remortgage to other lenders, when their fixed rate product deal ends. "We have decided it is not appropriate for Northern Rock to continue to shrink its activities, they have made substantial repayments to the government and is ahead of its repayment schedule," said Chancellor Alistair Darling. "It is right for them to maintain their lending in the housing market." He added that the decision was made in the climate when "you're facing the departure of foreign-based banks and some of the smaller building societies are not going into too much lending". Northern Rock made its announcement on the same day that the government unveiled a second package of measures to support the banking system. The measures include a scheme to offer banks insurance against them losing more money from their bad debts.